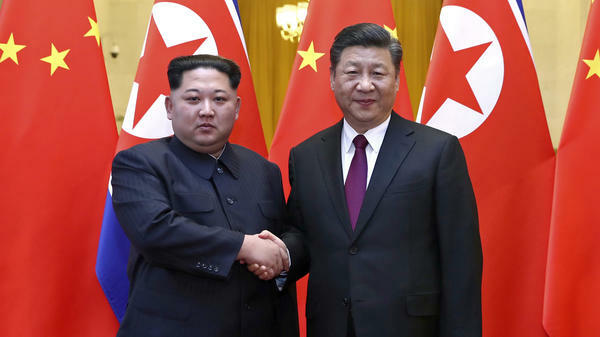 North Korean leader Kim Jong Un and Chinese President Xi Jinping shake hands in Beijing, in this photo provided by China's Xinhua News Agency in Beijing. Kim was making his first known trip to a foreign country since he took power in 2011. The official New China News Agency says Kim told Chinese leader Xi Jinping: "If South Korea and the United States respond with goodwill to our efforts, and create an atmosphere of peace and stability, and take phased, synchronized measures to achieve peace, the issue of the denuclearization of the peninsula can reach resolution." "The nuclear issue is the only obstacle" to good relations between China and North Korea, says Lu Chao, a North Korea expert at the Liaoning Academy of Social Sciences in the northeastern Chinese city of Shenyang, and without it being addressed, China would not invite Kim for a visit. Beijing residents couldn't help but feel there was an important visitor in town on Tuesday. Amateur videos and social media postings showed a dark-green train pulling into Beijing's main station. It was similar to the bulletproof boxcars Kim Jong Un's father Jong Il rode across the border during his trips to China, prior to his death in 2011. A motorcade of more than 20 vehicles, including an ambulance, was seen wending its way through the capital to the state guest house. Yet China's Foreign Ministry spokesperson Hua Chunying told reporters she had no knowledge of anything unusual, saying only that China's government would release any related information "in due course." The official New China News agency said Kim visited Beijing from March 25-28. Although the report did not explicitly state that Kim had already left the country at the time the report was issued, Lu Chao said the arrangement has traditionally been that the country's state news agencies would hold off on issuing their respective reports until the leader's armored train had trundled back over the Yalu River into North Korea. This sort of secrecy "may be more convenient for the two countries," Lu says, adding: "there's nothing odd about it." It is significant that Kim only visited the capital, and not other regions of Beijing. On a final tour to China in 2011, Kim Jong Il was taken to see the booming special economic zone of Shenzhen, adjacent to Hong Kong. That destination was intended to impress upon Kim China's experience, showing that leaders could open up their economies, while still hanging on to power. China is hopeful that, with adequate security guarantees, Kim Jong Un will follow their path. China labeled Kim Jong Un's first visit unofficial, but it bore all the trappings of an official visit. Officials of the two countries held talks at the Great Hall of the People in Tiananmen Square. Xi and his wife, Peng Liyuan, hosted Kim and his wife, Ri Sol-ju, at a banquet and then took in a cultural performance together. Xi addressed Kim as "comrade chairman," referring to his position as leader of the ruling Worker's Party. He told him that the "traditional friendship, established and cultivated meticulously by the elder generations of leaders of both parties and both countries, is the precious wealth of both sides." While this language of socialist solidarity has been typical of the China-North Korea relationship for more than half a century, China's application of sanctions and criticism of its neighbor's nuclear intentions led North Korean state media to criticize their Chinese counterparts last year as "despicable" for seeming to side with Washington against Pyongyang. The apparent mending of fences between North Korea, its neighbors and the U.S. began as recently as the beginning of this month, when South Korea announced that the North was willing to give up its nuclear weapons and enter into talks with Seoul and Washington, D.C.
North Korea agreed to abandon its nuclear programs in 2005, during six-party talks hosted by China. But Pyongyang stopped participating in the talks in 2009 and threatened never to give up its nuclear ambitions. Cheng Xiaohe, a North Korea expert at Renmin University of China, aka People's University, in Beijing, says the conditions were ripe in China for Kim's visit. China's leader Xi Jinping "is at the apex of his power," having just abolished term limits on the presidency and begun a second five-year term, Cheng observes. "And that means China must be proactive, and get involved in the changes on the Korean Peninsula." He adds that as China is not being included in the talks with South Korean President Moon Jae-in in April and President Trump in May, Xi needs to make sure China's national interests are respected. The White House said that China's government had communicated the upshot of Kim's visit to China on Tuesday. And Chinese state media report that China's top diplomat Yang Jiechi will visit Seoul this week to inform South Korea about the visit. North Korea's young leader, Kim Jong Un, is not known to have left his country on an overseas trip until this week. He went where North Korean leaders normally go for their first foreign visits, neighboring China. And he did it in secret. NPR's Anthony Kuhn joins us from Beijing to try and fill us in. Hi, Anthony. ANTHONY KUHN, BYLINE: Hey there, David. GREENE: So you did not know anything about this trip, at least not officially, until it was done, right? KUHN: Not officially, but it would've been hard to miss the massive security on the streets yesterday and this huge motorcade zipping through town. But amazingly, the foreign ministry said they knew nothing about it, until this morning when state media came out with the reports confirming that Kim Jong Un had indeed paid his first visit here. In a way, it felt like old times, you know. Kim Jong Un's father and grandfather used to travel to China in these huge, hulking armored trains. They never flew. And then the news of a trip only came out after they'd roll back over the border, so it was like old times in a way. GREENE: It's amazing the foreign minister just said they knew nothing about - or maybe it's not that amazing in China (laughter), I don't know, but that they deny any knowledge of all this happening. KUHN: That's how they do it. GREENE: Well, some of the photos we're now seeing from the event - I mean, it looks like even though we didn't know it was happening, China really rolled out the red carpet for Kim. Is that what happened? KUHN: Yeah. Well, it was a very formal visit in all but name. They said it was unofficial, but you had the first families of China and North Korea there. There was a huge banquet to welcome them. They took in a cultural performance in the evening, and then the language really harked back to the old days. There was this talk of socialist solidarity. You had Xi Jinping calling Kim Jong Un comrade chairman, talk of the brotherhood between the Communist Party of China and the Worker's Party of North Korea. So, you know, because China has been hitting North - China has been hitting North Korea with these sanctions over the past years, things have been really tense. But now it seems they're getting back to the way they have been for decades, really since the Korean War. GREENE: So given the context, I mean, given the whole nuclear debate with, you know, the debate over North Korea's nuclear program and pressure on China to do more, this cozy-looking visit is significant, right? KUHN: Well, yeah. It's significant because North Korea promised that it would give up its nukes in 2005, but then they changed their minds four years later. Then in - earlier this month, they promised again that they were willing to abandon their nukes, but this is the first time that Kim Jong Un has come out and said this in person to a foreign head of state. What Kim was quoted as telling Xi Jinping was that, if the U.S. and South Korea cooperate and they help to build a peaceful and stable environment on the Korean Peninsula, then the nuclear issue can be solved. It's not too surprising. North Korea had already promised to hold talks with Seoul and Washington and it could hardly leave out its main neighbor and ally. Now, this does not mean that at the end of the day Pyongyang will give up its nuclear weapons. It may choose to hold them or try to freeze them or something, but we'll have to see if talks even get off the ground. GREENE: OK. So this was China, though, wanting to make sure they were involved in whatever diplomacy is taking place. It - does this - the timing of this also have something to do with the tensions between Beijing and Washington? KUHN: It sure looks that way. I mean, look at all of this going on with China and the U.S. now. There's a trade war brewing, you know, you have tensions over Taiwan, over the South China Sea. And that's a very good time for China to point out that, hey, North Korea is a traditional ally. At the same time, the U.S. and China are on the same page about the North Korean nuclear issue. And so China informed the White House of Kim's visit while it was still a secret, and tomorrow they're going to send a top diplomat to South Korea to fill them in. GREENE: NPR's Anthony Kuhn talking to us from Beijing. Thanks, Anthony. KUHN: Sure thing, David. Transcript provided by NPR, Copyright NPR.